September is proving to be a busy month on Capitol Hill as we work to halt tax increases on the middle class and seniors, improve accountability in the Veterans Administration, strengthen national security and grow our nation's economy. As Chairman of the House Appropriations Committee, I ensured that all 12 federal spending bills were authored and approved by the Appropriations Committee before the end of July. We held over 100 hearings to complete the appropriations process through regular order. I'm proud of the work of this committee and count it a great honor to now have my portrait hanging along-side 20 former chairmen, including President Garfield, in the U.S. House Appropriations Chambers as I complete my six-year tenure at the helm of this committee. The portrait was painted by artist, Leslie Bowman. While we continue work in Washington, D.C., Governor Matt Bevin and I have exciting news on the home-front this month. On Friday, September 16th at 10:30 a.m. (ET), join Governor Bevin and me in Kentucky's Capitol Rotunda for an important announcement regarding progress for KentuckyWired, our statewide broadband network. Upon completion, high-speed, high-capacity broadband will be extended to every county in southern and eastern Kentucky. In the high-tech age in which we live, our creativity is our only limit to the opportunities available through broadband connectivity. This year, high school students with an interest in developing mobile applications can compete in the second annual Congressional App Challenge. Last year, a team of four students from Prestonsburg High School won the competition for Kentucky's Fifth Congressional District with an app called "Kentucky College and Career Readiness Pathway." The winning team received several awards for their mobile app, which was also displayed at the U.S. Capitol. This year, Amazon Web Services has donated $50,000 in AWS credits to be split among winning students across the country. Winners will be announced by the Internet Education Foundation during Computer Science Week in December. To compete in the 2016 Congressional App Challenge for Kentucky's Fifth Congressional District, students can register and submit their apps online at http://congressionalappchallenge.us. The deadline to enter is November 2, 2016. Later this month, I will be hosting two U.S. Service Academy Information Fairs in our region for interested high school students and recent graduates. Each year, I have the privilege of nominating a limited number of students from Kentucky's Fifth Congressional District for acceptance into one of our prestigious academies. 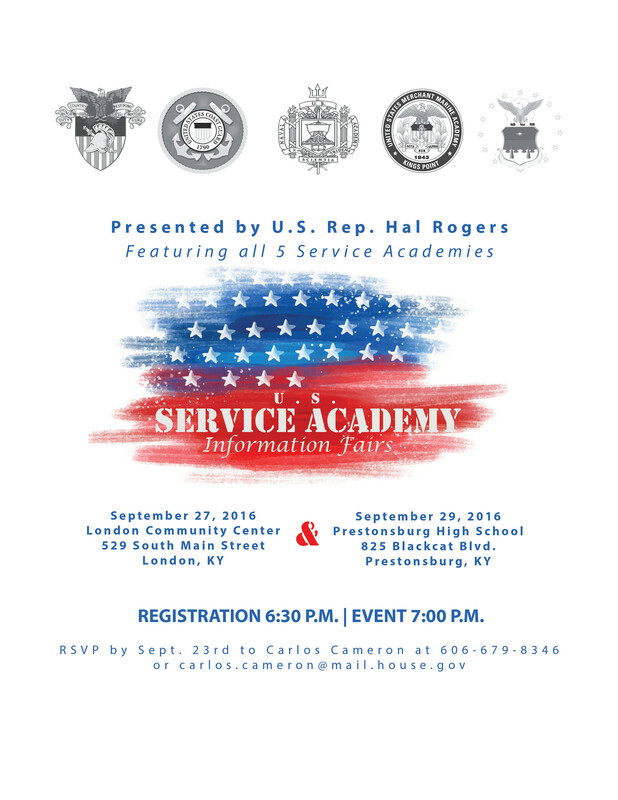 Join us on September 27th at the London Community Center or September 29th at Prestonsburg High School. Registration begins at 6:30 pm for both events. For more information, contact Carlos Cameron at 606-679-8346 or carlos.cameron@mail.house.gov. Click here to download a flyer for your school or community. 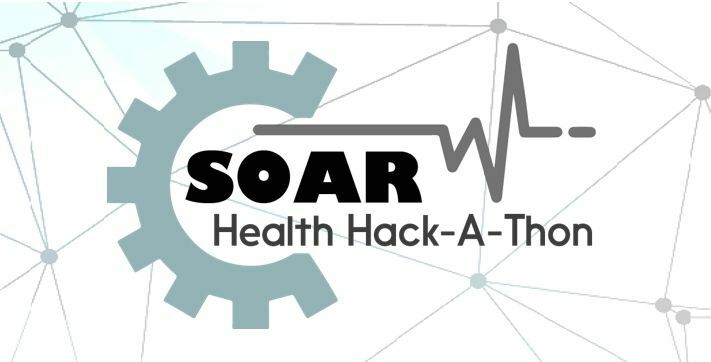 Coming up in October, SOAR has teamed up with the prestigious Massachusetts Institute of Technology (MIT) to host the Appalachian region's very first Health Hack-A-Thon. Special guests include Dr. Nora Volkow, Director of the National Institute on Drug Abuse, and Dr. Douglas Lowy, Acting Director of the National Cancer Institute. The Hack-A-Thon will take place October 6-8, 2016 at the Center for Rural Development in Somerset. For more information, visit soar-ky.org/hackathon. If you would like to receive more frequent updates on what's happening in Washington or Kentucky's Fifth Congressional District, please send me an email, join my Facebook page, follow me on Twitter, view photos on Instagram, or subscribe to my YouTube channel. Thank you to everyone who has dropped by to share your opinion -- let's keep the dialogue going!